I absolutely love switching up my makeup from time to time. Spring is the perfect chance to refresh our everyday makeup routine. Seasonal changes are a great opportunity to go shopping not only for a new wardrobe but makeup! Today we're going to discuss how to change up your makeup for the season. Let's start with base. As you know, I love natural face makeup. To me there's nothing better than makeup that looks like your actual skin while still perfecting your face. In Spring I love a light, dewy base. Even if you love full coverage foundation I totally recommend to try out a BB cream or a lighter weight foundation. If you have acne scars or discoloration you can easily spot conceal. That's what concealer is for. Let your skin breathe! One of the most important parts of Spring makeup is rosy cheeks! So be generous with the amount of blush you apply! Blush is an amazing product that a lot of people often skip out on. Blush makes you look so youthful and lively. I love it because it brings a beautiful flush of color to the face. After covering your face with all these products, blush makes your skin look healthy! Now on to my favorite part of makeup... eyeshadow! There's something so glamorous about eyeshadow! My favorite eye looks are sparkly, glittery ones! It draws attention to my eyes to really make them pop! During the Springtime opt for lighter eyeshadow colors instead of dark. Try even switching out matte eyeshadow for shimmery or glittery textures! You want to add less shadows to your face such as harsh contours or colors and highlight more of your features with blush, shimmery/light eyeshadows, and highlighter. Lastly, in the Springtime I love a glossy lip! Switch out matte liquid lipsticks to lip glosses or satin/ creamy lipsticks. In general, during this season, go for more creamy and liquidy products instead of powdery ones. It's much warmer and creams/ liquids are great for drier skin types like myself because they're more hydrating than powders. If you have oily skin make sure you powder really well. I hope you'll try incorporating some of these tips during the Springtime! Please comment down below and tell me how it worked for you! What do you like to do to switch up your makeup for the Springtime? Love the makeup bag, its so cute! 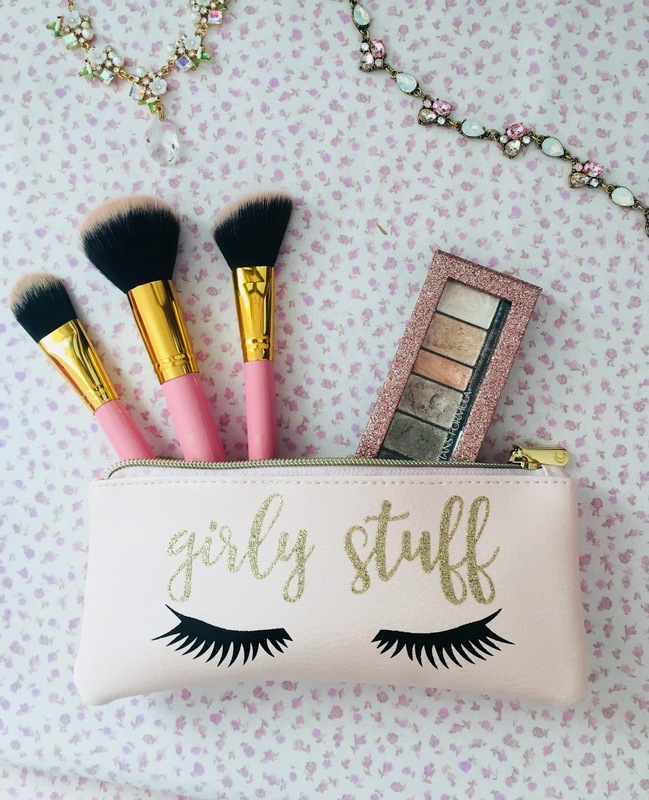 Such a cute makeup bag and the brushes are such a lovely colour! Great recommendations! I am also an eyeshadow junkie and love that spring makes it more acceptable to regularly do shimmers. I am not big on blush and only wear a light sweep of it. I find bronzer is better suited to my skintone paired with highlighter for that gorgeous summer glow.